I think I'm officially obsessed with The Body Shop. Since my first haul with them I have been dying to go back and get more of they're products! They are always having really good deals too so it's been hard to wait until I have used up these to go back for more. 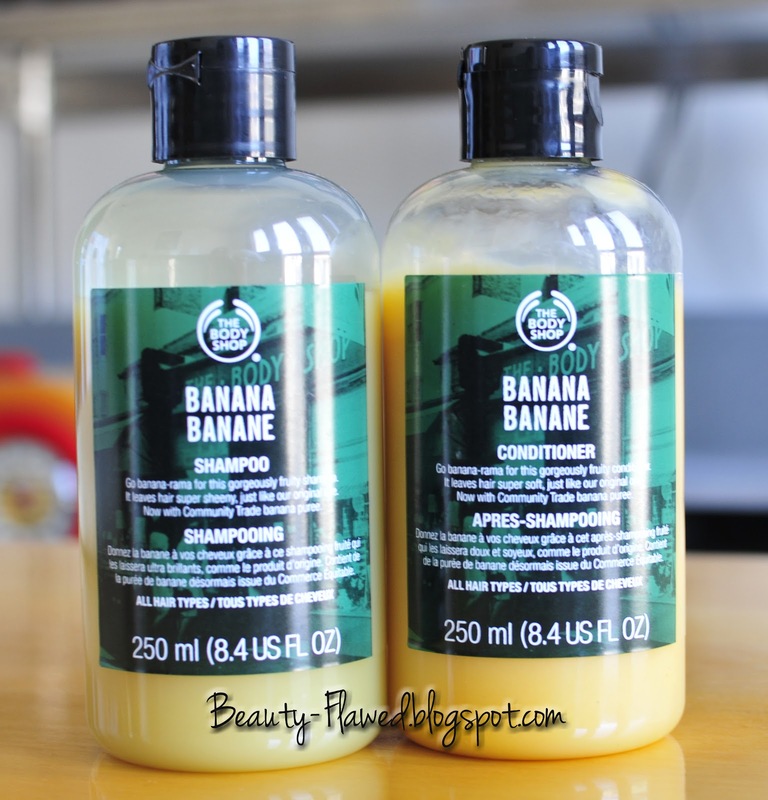 This is the Banana Shampoo and Conditioner from their hair care line and I must say I am pretty pleased with these. They smell awesome I wouldn't say really like banana but more of a tropical island fruit scent. Either way it is quite dreamy! The scent last's for a little while but I wish it would last longer once I put in all my styling products you can't really smell it so that could be good or bad depending on how you like it. This cleans hair really effectively I would compare it best with a clarifying shampoo. After using this my hair feels "squeaky" clean and I mean that because it is a bit hard to get thru after rinsing. Even tho it makes it a bit hard to get through in the shower I love this stuff it has done wonders to make my hair look shiny. A quarter size amount is enough to do my whole head mind you I have pretty long hair. This product has a nice lather to it too the suds are super soft. After using these my hair is shiny and soft! I really like that these get rid of any product I had left over in my hair from prior days styling and my hair never feels greasy because of them. I am also really liking that The Body Shop is a company with a very high standards when it comes to their ingredients and animal testing but also when it comes to giving back. I think they deserve a pat on the back for that. These products retail for $8.00 for 8.4 fl oz so you get a good size for the price. Currently this is the only size they come in. You can find this product on their website of in The Body Shop stores and sometimes at stores like Sephora and Ulta. Have you tried any hair care products from The Body Shop, whats your favorite? Conditioner Ingredients: Water (Solvent/Diluent), Musa Paradisica (Banana) Fruit (Emollient/Lubricant), Cetearyl Alcohol (Emulsifier), Cetrimonium Chloride (Hair Conditioner), Phenoxyethanol (Preservative), Hydroxyethylcellulose (Stabiliser/Thickener), Lecithin (Stabiliser/Emulsifier), Propylene Glycol (Humectant), Panthenol (Skin/Hair Conditioning Agent), Fragrance (Fragrance), Benzyl Alcohol (Preservative), Sodium Hydroxide (pH Adjuster), Ascorbic Acid (Antioxidant), Yellow 5 (Colour), Yellow 6 (Colour). I haven't bought anything from the Body Shop in years! Thanks for reminding me about it. I am a sucker for anything banana! No problem I hadn't actually shopped their ever before my first haul they have a lot of great stuff. After reading your review I am dying to get my hands on this shampoo and conditioner. I love the Body Shop and anything with a tropical scent! I have not tried any hair products from The Body Shop yet! I need to go and check these out!! They are really nice I was surprised by their product range. Don't you just love The Body Shop? I'm addicted to that dang place. I haven't been to the body shop in so long! I definitely need to go there. This shampoo sounds amazing. I really want to try these!! Yum, banana!! I thought for a long time that this store was quite pricey, but with constant sales, it's really not that bad. Banana sounds delicious... Though I'm not sure the cleansing shampoo is right for me. 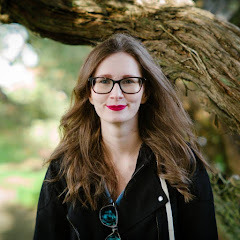 I got some hair butter in my GlossyBox (germany) last month and it was really awesome. Ohh I haven't tried those I'll have to keep them in mind! Can it be used as a hard water shampoo , cause there is a great problem of hard water in my area..
Or should I use dove shampoo!?? I'm not sure as I don't have hard water, but it couldn't hurt to give it a try. Just keep an eye out for a good sale and you'll more than get your money back for it.